If you are a baseball fan, you are probably familiar with this quote often credited to legendary baseball coach Sparky Anderson—”Losing hurts twice as bad as winning feels good.” I’ve got to wonder whether Sparky knew how right he was. His words are a handy summary of one of the chief tenets of behavioral economics—loss aversion—and good advice for those of us in the benefits field who want to change behavior. Decades of research have confirmed that losing hurts more than winning feels good. In fact, most studies indicate losses are twice as powerful, psychologically, as gains. People are highly motivated to avoid what they consider a loss. Just say NO! Stop missing out on your retirement plan match. Would you rather pay yourself or Uncle Sam? Increase your retirement savings and cut your taxes. Consider this health benefits story from Eric M. Parmenter, vice president, employer solutions, Evolent Health in Arlington, Virginia. Eric tells how two different large hospital/health clients budgeted $30 per month for each employee who completed a health risk assessment (HRA). While the cost was the same, one client used the $30 as a carrot (a gain) while the other used a $30 stick (a loss). Client A told employees it would provide a $30 discount on health premiums to those who completed the HRA. The $30 became the carrot for taking action. In contrast, Client B told its workers they would have to contribute an extra $30 for their health benefits if they chose not to complete the HRA—This $30 penalty was the stick, or penalty, that employees would incur. 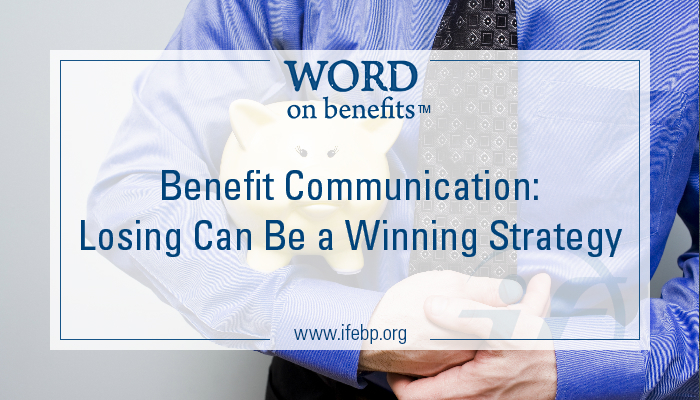 Both clients were able to improve the number of workers completing the HRA, but Client B, who framed the message as a loss, had a 95% HRA completion rate, compared with 80% for Client A who communicated what employees would gain. Framing a benefits message as a gain or loss can be effective, but it appears human beings are wired more to avoid the loss than seek the gain. Have you tried putting the focus on loss in your communications? Share examples in the comments below. I’d also show how much would be lost over 10, 20, or 30 years. Losing is one thing, losing big is another.